It’s Wednesday, and that means it’s time to start making your start and sit decisions for your fantasy football lineups. One of the best resources to help you is our flex fantasy football rankings for Week 7 of the NFL season. Remember that rankings change throughout the week, so be sure to check our staff rankings for updates. 1. Todd Gurley, LAR @ SF (RB1) — Did you think he’d be ranked anywhere else? 2. Saquon Barkley, NYG @ ATL (RB2) — The Giants aren’t playing well, but that isn’t stopping Barkley. 3. Melvin Gordon, LAC vs TEN (RB3) — The heavy volume continues for Gordon. He’s locked in as a top-end RB1. 4. Kareem Hunt, KC vs CIN (RB4) — Kansas City firing on all cylinders has really opened things up for Hunt. 5. Adam Thielen, MIN @ NYJ (WR1) — Can he top 100 yards for a seventh straight game? The matchup says he can. 6. 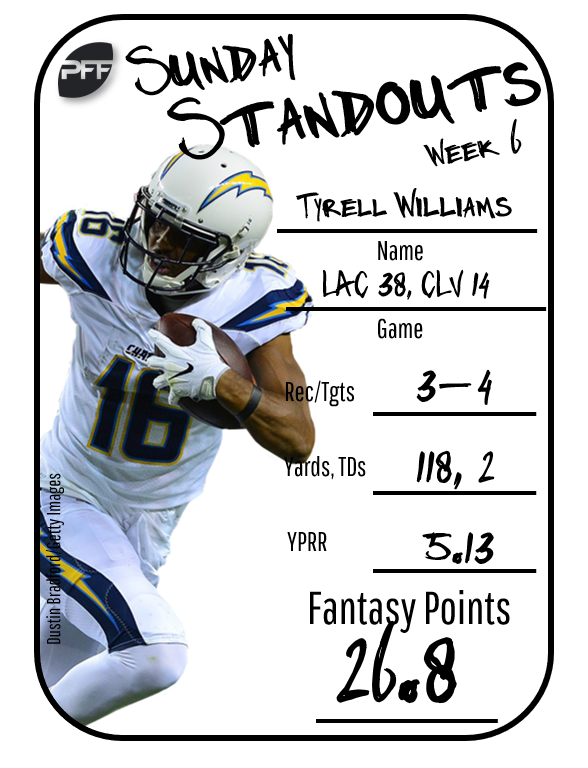 Tyreek Hill, KC vs CIN (WR2) — Hill has the highest fantasy weekly ceiling among wide receivers and could put on another show Sunday night. 7. Ezekiel Elliott, DAL @ WAS (RB5) — No player has seen a larger touch share this season. 8. Joe Mixon, CIN @ KC (RB6) — Mixon projects to again see a healthy workload and is a rock-solid RB1 play. 9. David Johnson, ARI vs DEN (RB7) — He’s heating up and managed to produce a solid fantasy day despite his team being dominated last week. 10. Julio Jones, ATL vs NYG (WR3) — Over 700 receiving yards and no touchdowns, but it doesn’t matter. You start Jones every week. 11. Odell Beckham Jr., NYG @ ATL (WR4) — Last week didn’t work out well, but Beckham bounces back in a favorable matchup. 12. Alvin Kamara, NO @ BAL (RB8) — This is a tough matchup for Kamara, but his upside keeps him in the RB1 conversation. 13. Michael Thomas, NO @ BAL (WR5) — The Saints get a tough draw following their bye, but Thomas is an every-week fantasy WR1 regardless of his opponent. 14. James White, NE @ CHI (RB9) — He doesn’t touch the ball much as a runner, but White’s involvement in the passing game keeps him on the fringes of RB1 territory. 15. A.J. Green, CIN @ KC (WR6) — Green gets a plus matchup in a potentially high-scoring game. 16. DeAndre Hopkins, HOU @ JAC (WR7) — Yes, it’s against the Jags, but don’t get cute with Hopkins this week. 17. Mike Evans, TB vs CLE (WR8) — Look for Evans to bounce back after last week’s down game. 18. Keenan Allen, LAC vs TEN (WR9) — Allen saw tough coverage last week, but he’ll continue to see heavy volume and is in the WR1 conversation. 19. Robert Woods, LAR @ SF (WR10) — With Cooper Kupp banged up, Woods should see extra work this week. 20. Travis Kelce, KC vs CIN (TE1) — Kelce’s upside in the Chiefs’ high-powered offense makes him this week’s top tight end play. 21. Jarvis Landry, CLE @ TB (WR11) — This matchup is too good for Landry to not bounce back. 22. Stefon Diggs, MIN @ NYJ (WR12) — Diggs saw a shadow from one of the league’s best corners last week. He won’t this week. 23. Brandin Cooks, LAR @ SF (WR13) — Expect plenty of Cooks with Cooper Kupp likely sidelined this week. 24. Christian McCaffrey, CAR @ PHI (RB10) — His rushing volume is down, but McCaffrey is so dangerous as a receiver. 25. 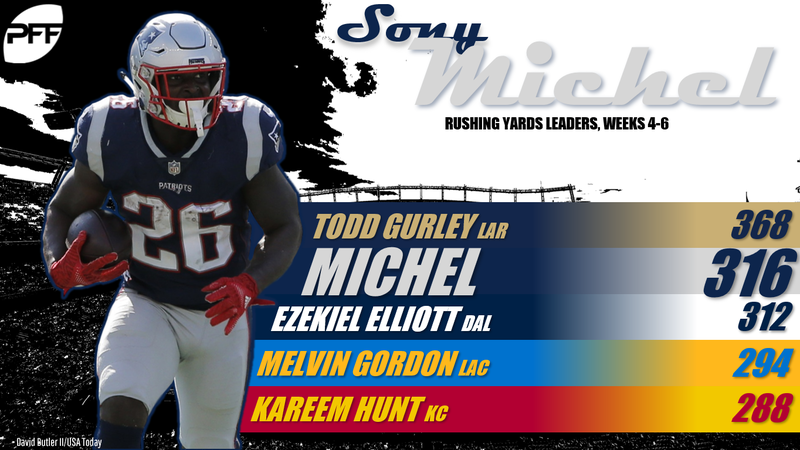 Sony Michel, NE @ CHI (RB11) — He’s topped 100 yards in two of the last three weeks and is one of the league’s most heavily used backs in the red zone. 26. Tyler Boyd, CIN @ KC (WR14) — Boyd is very much in play as a strong WR2 in a favorable matchup this week. 27. Carlos Hyde, CLE @ TB (RB12) — Sorry Nick Chubb supporters, but Hyde is still dominating touches in the Browns backfield. 28. Golden Tate, DET @ MIA (WR15) — Tate’s high target floor and bi- play upside lock him in as a WR2. 29. LeSean McCoy, BUF @ IND (RB13) — It’s a slim week at running back, and McCoy should see plenty of volume. 31. Zach Ertz, PHI vs CAR (TE2) — He leads all tight ends in targets, catches, and fantasy scoring. 41. Tevin Coleman, ATL vs NYG (RB18) — Devonta Freeman is now on injured reserve, but it’s tough to trust Coleman as anything more than an RB2 with the committee in the Falcons backfield. 48. Tarik Cohen, CHI vs NE (RB21) — Cohen will be gamescript-dependent going forward, but he’s in play as an RB2 against the Pats. 58. Peyton Barber, TB vs CLE (RB26) — Barber is the Bucs lead back, but it’s still tough to trust him as anything more than a flex. 64. 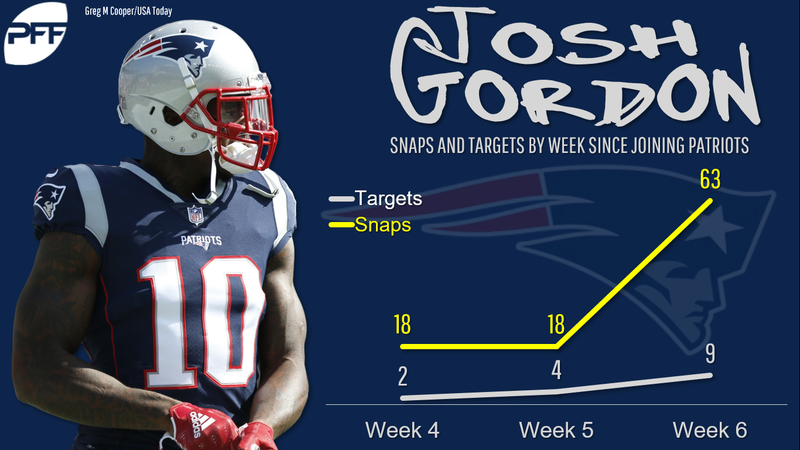 Josh Gordon, NE @ CHI (WR31) — His stock continues to trend up. A big week is brewing. 74. Chris Godwin, TB vs CLE (WR35) — Keep in mind that Godwin has consistently been the Bucs No. 4 wideout in terms of routes run this season. 81. 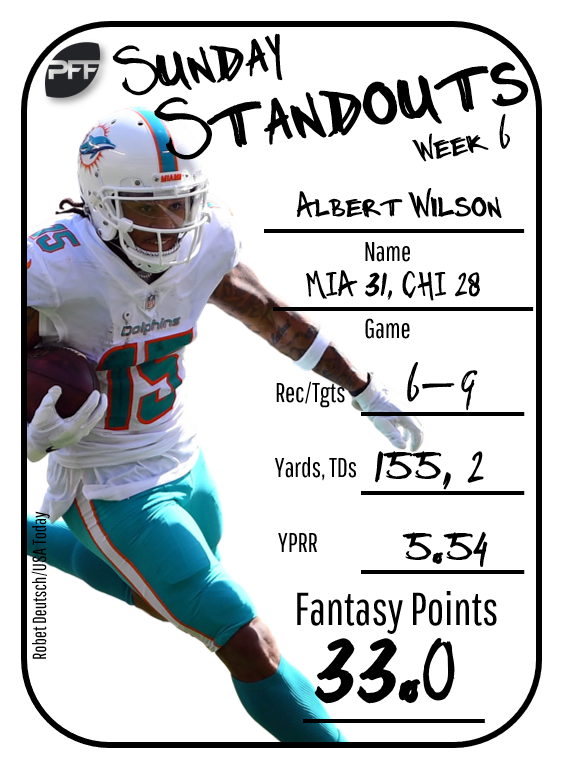 Albert Wilson, MIA vs DET (WR38) — Wilson was amazing last week, but his role in the Miami offense is very volatile for fantasy purposes. 90. Duke Johnson, CLE @ TB (RB38) — Johnson averages just 5.5 touches per game. 97. Keke Coutee, HOU @ JAC (WR47) — Cole Beasley torched the Jags out of the slot last week. 108. Latavius Murray, MIN @ NYJ (RB43) — Murray’s fantasy value is closely tied to Dalvin Cook’s health. 114. Greg Olsen, CAR @ PHI (TE13) — Olsen saw seven targets in his return game. He’s back on the fringes of TE1 territory. 124. Derrick Henry, TEN vs LAC (RB45) — With the Titans offense struggling, it’s nearly impossible to start Henry this week. 135. Josh Reynolds, LAR @ SF (WR69) — Reynolds is a sneaky deep name to know with Cooper Kupp banged up. 143. Ronald Jones II, TB vs CLE (RB50) — Jones is just a bench stash at this point.